In the 1830’s there was a great influx of settlers into Lafayette Township including William Walters, William Bleekman, Ephraim Coy, Silas Gates, Alva Averill, Phineas Needham, John Mead, and William Averill. It is during this time period that Shaw cemetery was likely started. The earliest date found on a headstone is that of Mary Mead, a daughter of the above-mentioned John Mead and his first wife Deborah. Mary died in the spring of 1839 but there is evidence that the cemetery may have been started as much as a decade earlier. The half acre referred to was sold by Mallory to the Board of Education on March 27, 1856 for the building of the aforementioned “present frame schoolhouse”. That building stood on a lot on the southeast corner of Westfield and Chippewa roads. The land for Shaw cemetery was acquired by the township of Lafayette in three purchases. While the cemetery is known as `Shaw’, it wasn’t until 1866 that George came and purchased land in Lafayette Township. In the fall of 1893, his daughter-in-law Emma would become the first known burial in this back parcel and the first actual Shaw burial at the cemetery bearing his name. The same described parcel of land is recorded as being sold by the Ohio Farmers Insurance Company to the Trustees of Lafayette for the sum of one dollar on December 14, 1888 in Volume 52, page 77. This map can be found with the deed in Volume 29, page 291 and shows the boundaries of all three purchases along with the dimensions. When the County Home Cemetery ceased to be used after 1950, those who died there and had no family or burial arrangements still needed to be put somewhere. From about 1955 to 1975 most of those individuals ended up at Shaw cemetery; buried in the back two rows with nothing more than a small metal funeral home marker to mark their final resting place. Almost all of those markers have since disappeared. By examining the dates for those burials whose location is somewhat known, it appears that they were buried one right next to the other in chronological order. The County Home eventually mandated that incoming residents needed to make burial arrangements prior to admission – thus eliminating the need for those burials here. After that point, the cemetery essentially ceased to be used; with only one more burial known to have been made since. Few original records exist for this cemetery. The burial listings were compiled from the remaining headstones, death certificates, and a few death notices from old newspapers. Only the map mentioned above and the WPA map for the cemetery were thought to have survived to show how the cemetery was laid out. 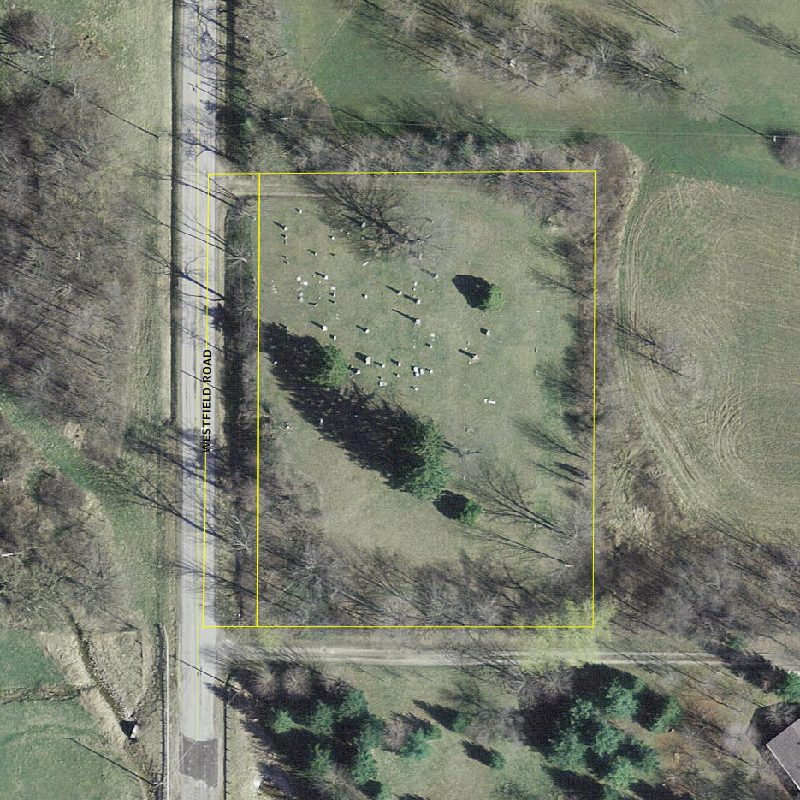 A map of Shaw Cemetery was discovered in township records in 2011. The map was drawn up in 1960 by W.W. Anderson, County Engineer. 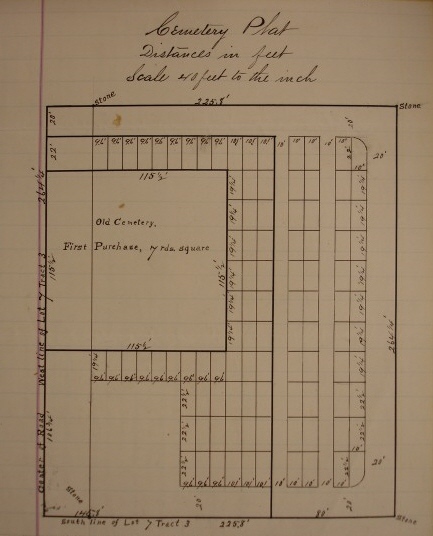 It is a copy of the cemetery plat drawn up by A.D. Sheldon in 1888 which covered the back part of the cemetery. That plat map was in possession of the township trustees (in 1960) and was in bad condition. No records existed for the front part of the cemetery and the names and dates for the new map were taken from the existing headstones. The lots were not staked and the locations of graves on the map were indicated as potentially being off by as much as 1 to 5 feet. The lots were not numbered before 1960 so a numbering system was implemented with this new map. It also provides information on the burial locations of a few unmarked graves in these newer areas. Information obtained from this map was used in organizing the burial listings found here. The original cemetery was laid out in nine rows of six lots each. Each lot measures 9.6 feet by 19 ¼ feet. In the area of the cemetery acquired from the Bostwicks the lot sizes vary somewhat. Lot dimensions in this area are either 9.6 feet or 10.1 feet long by either 19 ¼, 20, or 22 ½ feet wide. From the Bostwick land, one lot was added to the north edge of each row and three rows of eleven lots were added to the rear. Four lots were added to the south end of each pre-existing row except where made impossible by the lowlands in the southwest corner. In those cases only one lot was added. With the Shaw addition we see the same variation in lot sizes. While all the lots measure 10 feet long, they range from 19 ¼ feet to 22 ½ feet wide. The driveway is 20 feet wide and, while mostly unused, actually runs all of the way around the perimeter of the cemetery. Walkways measuring ten feet wide run between rows 12 and 13 and between rows 14 and 15. Per the WPA map, all lots in this cemetery are setup for seven gravesites. The individual grave designations found in the WPA records have been included here. One point of interest on the 1960 map is that it shows many of the newer lots in the cemetery being used as five-grave lots. At whatever point the schoolhouse lot was vacated, it was plotted out for gravesites. The low area in the southwest corner was neither used nor plotted out. Lot markers can be found for a few lots – such as the Richardsons, Shaws, Lahrs, and Rices – but those for the McConnell family lot are the most prominent. They are concrete pillars which stand several feet above the ground and seem to have once been connected by chains.